AMD (NYSE:AMD) was doing their usual counter-IDF demos in San Francisco last week, complete with 28nm GPUs and Trinity laptops. 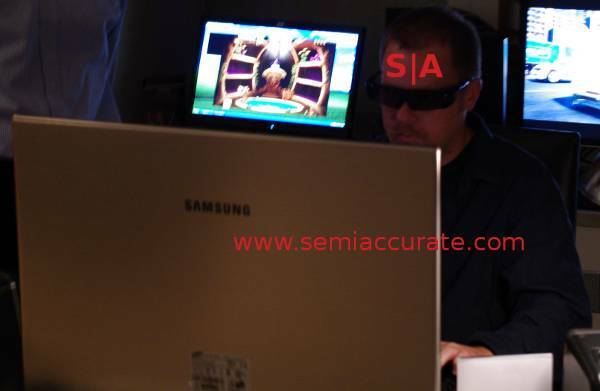 No specs were disclosed, but insiders tell SemiAccurate that both chips are in good shape. What you are seeing here is a 28nm Southern Islands/GCN/HD7xxx laptop chip running in a bog-standard AMD mobile development board. The card itself is an MCM, but that is about all AMD would say, no specs or release dates. Luckily, we know the dates already, and insiders tell us it is Tahiti silicon. (Note: Yes, I know about the rumors, but I’ll take my sources’ word any day). These parts tipping up in December, subject to the whims of ODMs and OEMs (Note 2: I know those rumors too, some ‘journalists’ seem unfamiliar with how to use a calendar, December is actually still in 2011). (1) Raincoat demo: Where a presenter runs out, flashes something at you, and before your jaw (hopefully) stops hanging loose, they close the raincoat and run away.